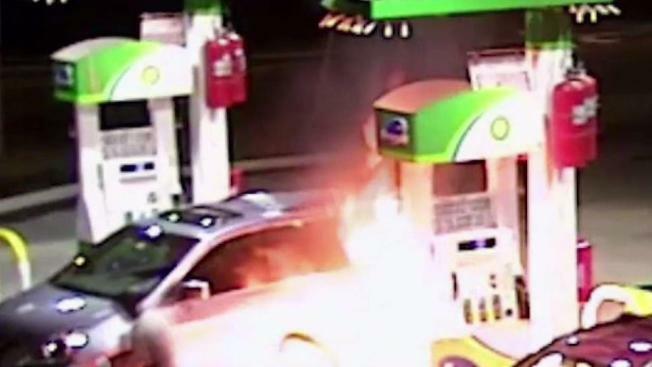 A 26-year-old Brooklyn man is facing arson charges after he was caught on camera torching a 7-Eleven earlier this week, police say. Farkol Islam was also charged with reckless endangerment and criminal mischief in the Staten Island fire that left a bystander coughing up blood early on Monday. Attorney information for Islam was not immediately available. It was just before 2 a.m. Monday when surveillance footage from the station, on Richmond Avenue near the College of Staten Island, showed the man apparently absentmindedly filling up a canister. He is then seen glugging gas all over the base of the pumps, lighting up a piece of paper and unleashing a booming fireball. Gerard Lara suffered internal injuries from the blast, and said he collapsed following the blast. "I could've passed out," he said. "I could have died."